MakeMe3D turns your movies into real 3D-videos! In the movies nothings works anymore without 3D; now the technique enters the home cinema and even the PC. Engelmann Software presents the world premiere Windows-Software MakeMe3D, which can convert existing 2D-videos automatically into the third dimension. The new 3D-videos are compatible to the known Anaglyph 3D glasses and to the new Stereoscopic 3D Hardware. MakeMe3D: At the touch of a button into the third dimension. ...... not necessarily have to be complicated. The program supports the import of 2D-videos and others in formats Video-DVD, AVI, WMV, MP4, 3GP, MPG and TS, to mention only the most important. 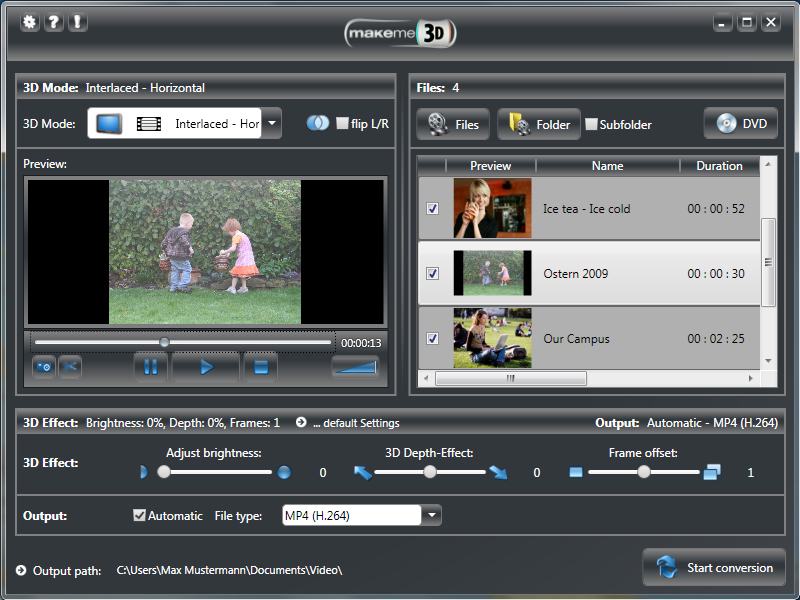 The program stores the converted 3D-videos in formats AVI, MPG, MP4 and WMV. It is possible to select from numerous target profiles. For example, the video resolution is automatically adjusted to the parameters for iPad, PlayStation PS3 or Xbox 360. When converting a large number of 2D-videos the batch mode is an option. This mode converts all videos of a list and saves user precious time. Qweas is providing links to MakeMe3D 1.2.11.1100 as a courtesy, and makes no representations regarding MakeMe3D or any other applications or any information related thereto. Any questions, complaints or claims regarding this application MakeMe3D 1.2.11.1100 must be directed to the appropriate software vendor. You may click the publisher link of MakeMe3D on the top of this page to get more details about the vendor.